Do you want a Hog roast machine yet don’t have enough money? Do you not have a large enough table for all your friends or family? Why not hire the Hog Master? 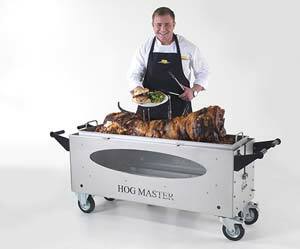 Hiring a Hog Master from us is a perfect way to hog roast without actually buying a hog roasting machine. You could hire a hog roast caterer to cater for you but where is the fun in that! If you’re a man reading this I’m sure you would want to carve the meat of the hog yourself. All men take over BBQs and this will be the same with the hog roasting machine, nothing feels manlier than carving a sizzling hot juicy hog in front of family or impressing your friends. Imagine a hot sunny day and you are carving a hot juicy hog for all your family, who are sat on a huge table, under a shady gazebo. It’s a perfect summer’s day. Hire a Hog Master this summer and be the talk of the neighbourhood. We do spectacular deals which include meat, gazebos, serving tables and cleaning packages. When hiring a Hog Master you don’t only get to cook a hog, there are many other meats you can cook such as crispy chicken, lovely lamb, beautiful beef, tasty turkey and perfect potatoes. Yes potatoes! 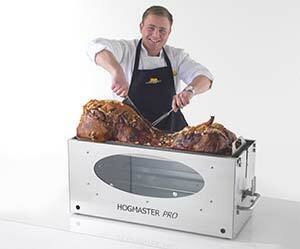 Or try something you think would taste perfect roasted on the Hog Master and you can cook multiple meat at once. If you are an experienced Hog Master customer you can hire out a spit roast kit which rotates on the pole to perfectly cook the hog from every side or whatever meat you put on. You can hire out a Hog Master for the weekend, the week, or even the month! If you are hiring out a Hog Master we do an amazing deal, which is if you love the Hog Master that much, you can pay instalments while keeping the machine and on the final payment you keep the machine. How great is that? You will know how to use it before you even bought it, plus with every purchase or hire you get a full set of instructions of how to use the Hog Master plus our delivery is done by a Hog Master expert who can help you get the best out of the Hog Machine as well as giving handy tips. The Hog Master is an amazing hire for more details talk to one of our experts or fill in an enquiry form on the Contact Us page. Hog Roast Hire for a DIY Wedding!